Baggage scanners plays strategic role in security of the places like airports, customs, and other critical infrastructure such as government buildings, public places. Baggage scanners are aggressively used at the airports, spending high costs for baggage and security management. In 2017, American Airlines announced its investment in 3D carry-on-bag scanners at 8 U.S. airports, amounting USD 6.0 million, to speed up the process with accuracy. Airports security and traveller experience are top priority functions. Global airport security market is expected to reach USD 45 billion by 2018, that vindicates the growth in baggage scanner shipment across the globe. With the rising commuters all over the world, passing through scanners, there is a need for efficient baggage scanners to avoid the possibilities of terrorism and related incidents. In 2016, 77 countries experienced at least 1 death from terrorism. Portable baggage scanners have high demand from the event management industry for the events prone to terrorism and violence with an objective of mass destruction. Biological, chemical and nuclear weapons are used for mass destruction which is detectable when passed through scanners. 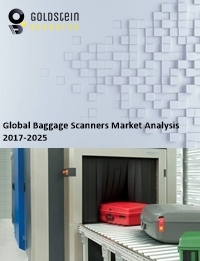 Goldstein Research analyst forecast that the global baggage scanners market size is set to reach USD 4.2 billion by 2025, growing at a CAGR of 5.1% over the forecast period. The technological advancement in the manufacturing of baggage scanners, rising terrorism, government, aviation, banking and other industries expenditure on security, among others are some of the factors inclined towards the growth of global baggage scanners market. The report covers the present ground scenario and the future growth prospects of the baggage scanners market for 2017-2025 along with the global sales and global revenue of the baggage scanners. We calculated the market size and revenue share on the basis of revenue generated from major players across the globe. We have forecast the market on the basis of baggage scanners manufacturers, smart fabric suppliers, baggage scanners suppliers and distributors, demand and supply chain, smart wearable industry, fashion industry mergers and collaborations. On the basis of product size, small size baggage scanners accounted for largest market share of 36.8% in 2017. There is outsized number of small size baggage scanners predominantly used in various areas, where commuters are carrying on-the-go baggage such as in airports, rail stations, shopping malls, government buildings, community centers and sport clubs among others. Value of shipment of baggage scanners is highest from the airports, which are using nearly all types of baggage scanners, thus airports aid to the growth of global baggage scanners market at a rate of 4.8% annually. Baggage scanners market outlook 2017-2025, has been prepared based on an in-depth market analysis from industry experts. The report covers the competitive landscape and current position of major players in the baggage scanners market. The report also includes porter’s five force model, SWOT analysis, company profiling, business strategies of market players and their business models. Global baggage scanners market report also recognizes value chain analysis to understand the cost differentiation to provide competitive advantage to the existing and new entry players. With the rising expenditure on security and investments to manufacturers, baggage scanners are going through technological advancement, which is setting a trend in favor of global baggage scanner market. While scanning, liquid, electronic devices and gel products had to be separated from the baggage, but technology used in hospitals is now being upgraded as per the baggage scanning purpose, to provide detailed view of the baggage even to find a needle in the haystack. Growth of commuters, rising investments in R&D and threat of incidents like terrorism, hijacking, mass destruction, fire, are the factors driving the growth of global baggage scanner market. Countries with large number of commuters such as in U.S.A., China, France, and Spain are impacting the supply of baggage scanners in order to provide security and peace to the people. U.S. airports screen more than 2 million passengers daily, which need speedy and accurate scanners. Along with the rising travellers per year, new threats develop, that needs continuous improvement in prediction algorithms. Updated algorithms purchased from scanning equipment manufacturers are proprietary, expensive and updated in long cycles. These factors relating to prediction algorithms challenge the security system and accuracy of the baggage scanners. Based on geography, North America accounted for largest market share of 28.7% in 2017 of the total global baggage scanners market. There is huge demand of baggage scanners from North America region, where security system is proactive towards occurrence of any kind of incident. Along with the baggage scanner manufacturers in U.S.A., it also tops the list of countries expenditure on internal security, being the top consumer of baggage scanners. Asia-Pacific baggage scanner market is growing at rate of 4.1% annually on the back of growing number travellers to and fro in Asia-Pacific region and rising number of new developed airports to maintain the growth of APAC travel and tourism industry. Global baggage scanners market report comprises of the following companies as the key players in the baggage scanners market: Rapiscan Systems, Smiths Detection, Morpho Detection, LLC, Nuctech Company Limited, Gilardoni SPA, Daifuku Co., Ltd., Beumer Group, Aventura Technologies, Inc.
What is the revenue of baggage scanners market in 2016-17 and what would be the expected demand over the forecasted period?